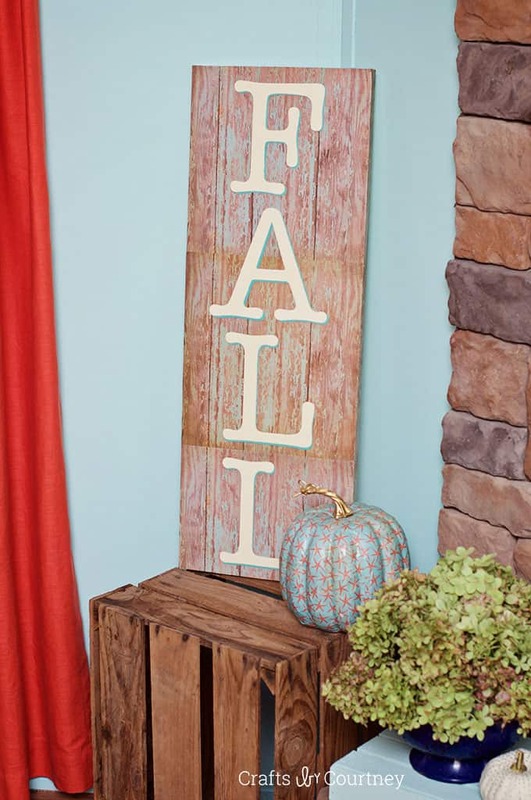 You can make your own fall sign in three easy steps! 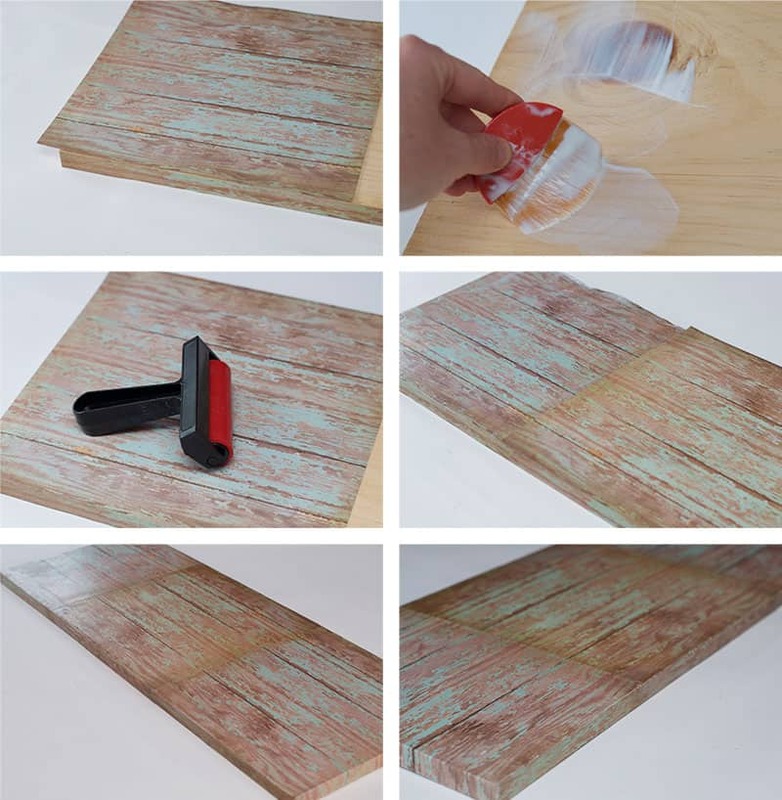 You're going to use wood, scrapbook paper, and letters. 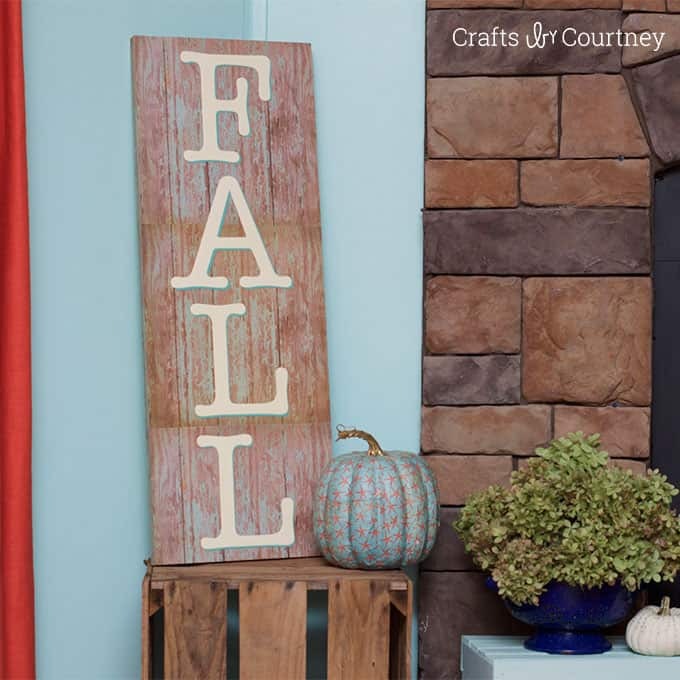 This autumn sign is easy to customize! Skills Required: Intermediate Beginner. 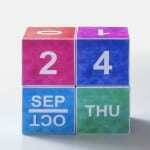 This autumn sign project will test your knowledge of Mod Podging pieces of paper without wrinkles. 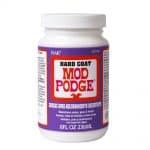 I give you tips below, but it helps if you have prior experience with Mod Podge since this is a large piece of wood. Since autumn is here, I really wanted to make a new DIY fall sign for the house. I made a Harvest sign last year using vinyl, so this year I thought I'd give Mod Podge a try and see what I could come up with. I was debating on a Halloween sign or Fall, and finally Fall won out. I knew I would be able to keep it up a lot longer if I did! What I was really excited about was using some wood patterned scrapbook paper that I've had in my stash for awhile now. I'm sure you know the feeling of pulling something out of your stash and finally using it. What can I say – it's a rush. We'll get to those steps in a moment. First let's talk surfaces. You can get wood for your fall sign just about anywhere – a construction site, a lumberyard, a home improvement store. At some Home Depot or Lowe's they'll even cut a board for you to the size you want (and they have bins of extra pieces!). There's no reason to purchase an expensive board (pine is fine). Just make sure the board is relatively smooth and it doesn't have any huge knots that will impede your Podging. You can even use canvas or an alternative surface if you like. It doesn't have to be wood! My only recommendation for you is that you stick with a surface 12″ wide or smaller – OR the width of your scrapbook paper if it's less than 12″. That way you don't have to patchwork everything together. It will make your life easier. 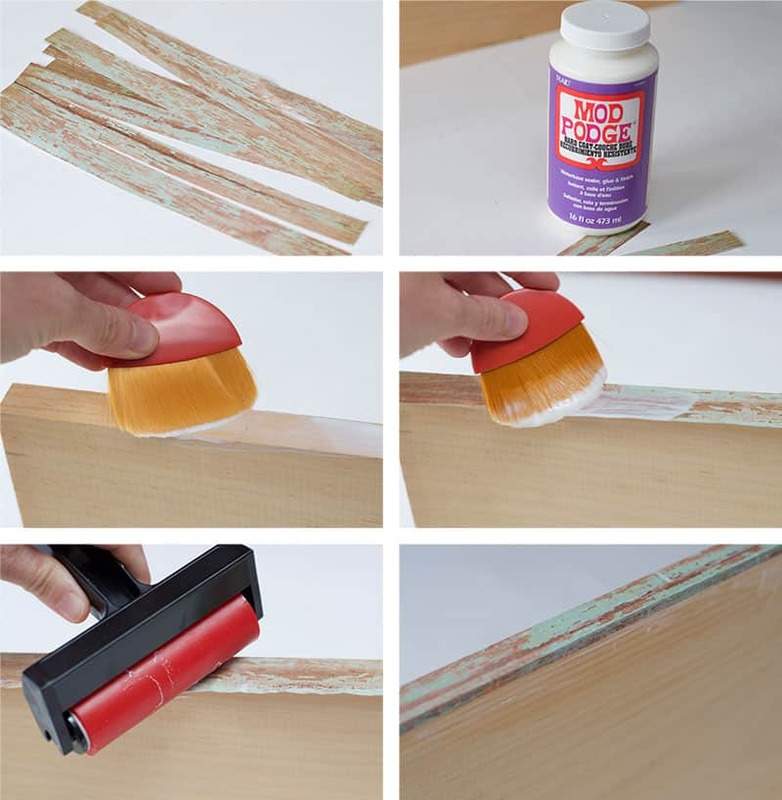 If you happen to be using a thinner paper (or wrapping paper, for example), you should consider misting the paper with water before you apply the Mod Podge and place it down. I had to do that in my floral DIY coat rack project. It works quite well! I keep a misting bottle in my craft room for Mod Podging thin papers. 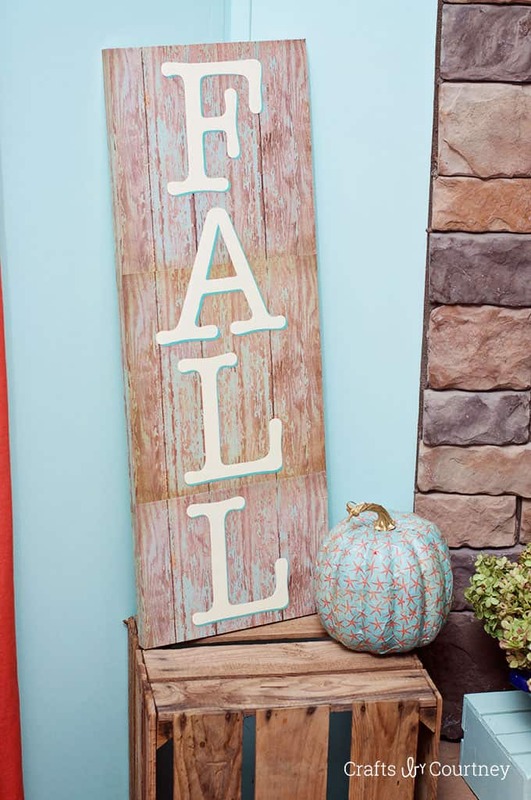 You can Mod Podge letters on the top of your autumn sign, but don't limit yourself to paper letters. 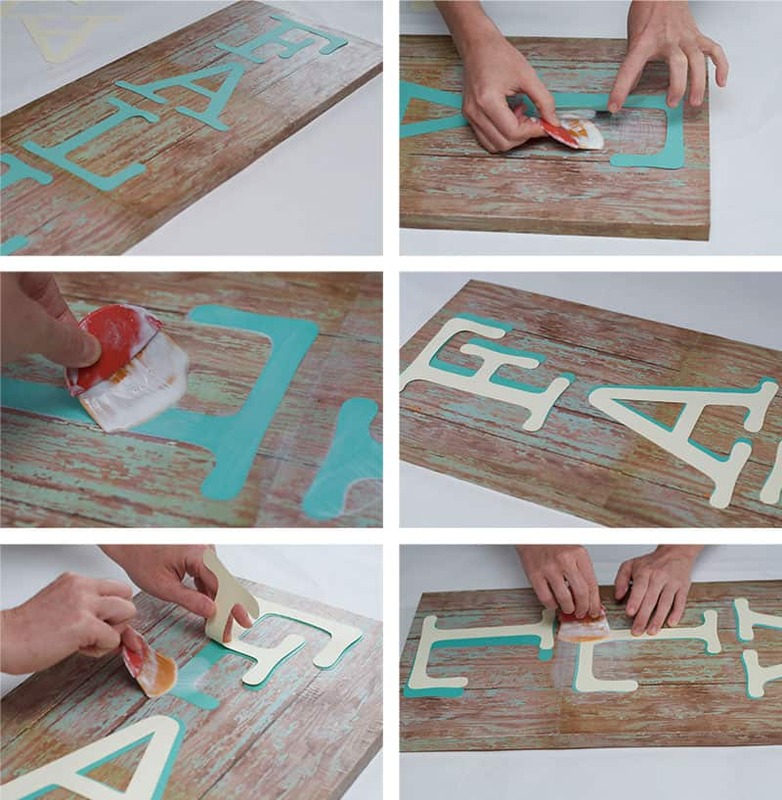 Wouldn't it be fun to use paper mache letters – or wood letters? 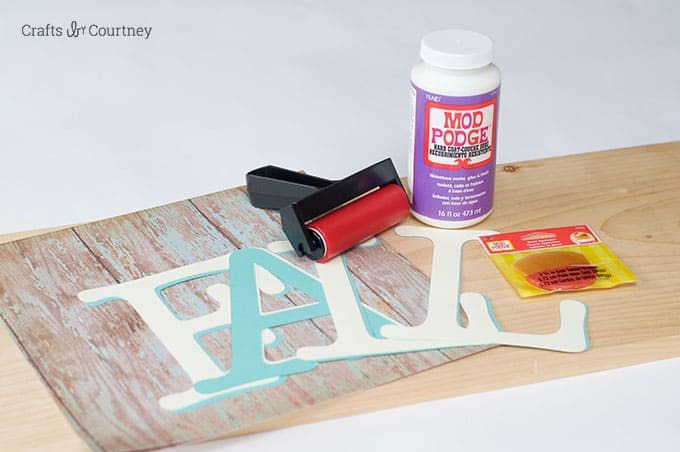 You could even stencil them onto the board directly with acrylic paint (yes, you can paint on top of Mod Podge). Now that we're done with the FAQ, continue reading to get the complete autumn sign tutorial! I cut my scrapbook paper into strips, then covered the sides of the wood with the strips and the Podge. I added a little more Mod Podge on top with my applicator and used my “handy dandy” Mod Podge brayer to smooth out any bubbles. 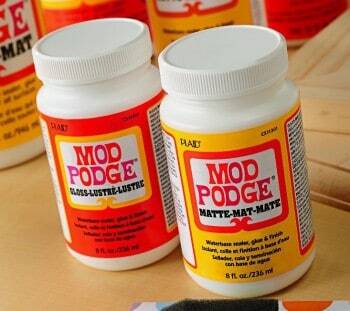 If any scrapbook paper comes up, add a little bit more Mod Podge and then smooth down again. Now it's time to add your scrapbook paper to the top of your autumn sign!! I needed three pieces of scrapbook paper for this part. I started at the top, by adding a layer of Mod Podge to the wood then laying my scrapbook paper on top. Once again I used my roller to smooth out any bubbles. After I had all three pieces down, I covered the top of the scrapbook paper with more Mod Podge. Since the scrapbook paper was not the exact size of the wood on one edge, I waited until the Mod Podge dried and cut off the excess with my X-Acto knife. On a side note, I found this scrapbook paper at Hobby Lobby. You can also find woodgrain scrapbook papers online. You're going to need letters for this craft. I used my Silhouette cutting machine to cut my letters, but you could always find pre-cut letters at the craft store, print letters and cut, etc. Whatever is easiest for you. There are options if you don't have a cutting machine. I really wanted a drop shadow effect with my lettering, so I cut out two sets of letters in the same size but different colors. I laid out my first set of letters, then added my Mod Podge. Once it dried I then added the next set of letters. After I let my fall sign dry for an hour, I was ready to display! 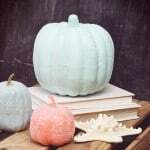 Decorate around your sign with pumpkins, like these coastal sand fall pumpkins. What do you think of my autumn sign?!?! I'm super excited how it turned out, and I love the colors here. I feel it fits my style perfectly. 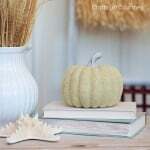 Fall is such a fun time to decorate, it's just makes me feel so happy. What about you? Now I need to make a sign like this for Thanksgiving – and Christmas – and every other holiday! If you guys want to get even more crafting inspiration, be sure and sign up for my newsletter. It's the best of what I make. This sign is super cute! You did a great job!